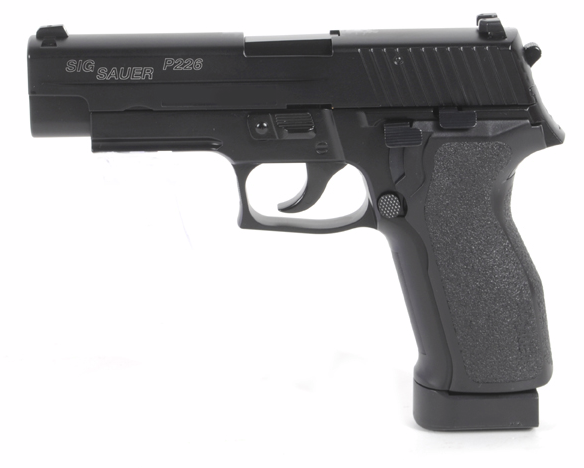 Easily one of the most anticipated pistols to come from Cybergun licencing - a Co2 powered, full metal SIG Sauer P226! Officially it is the E2, which gives it a marginally slimmer profile as well as adjusting the grip texture for improved weapons handling...though that's not the part that has everyone excited. It is rather the Co2 magazine powering this beauty! You have a heavy-weight metal slide, heavy-duty recoil spring and a kick that is unparallelled among the SIG family of pistols. As soon as you pick it up, it sits comfortably in your hand and all of the controls are exactly where you would expect them; it is extremely intuitive to manipulate. Like its green gas predecessor, stripping the gun is done by simply releasing the magazine, pushing the disassembly lever up and removing the slide, that's it! Simple to take apart, making it a dream to adjust the hop up for even more accurate shooting. Magazine capacity is a respectable 24 BB's, giving roughly 2x magazines per Co2 capsule.